Yesterday the news leaked that a well-received crime novel The Cuckoo’s Calling by debut novelist Robert Galbraith was actually penned by JK Rowling. The story made headlines just in time for the Sunday news cycle – traditionally a quiet phase in world media. A story of that magnitude should by rights have dominated all talk shows and social media for at least 12 hours. The only other likely competitor was the birth of a new heir to the British throne, but the Duchess of Cambridge was showing no imminent signs of going into labour. But the Rowling story had the bad luck to coincide with two unexpected breaking news events – the not-guilty jury verdict in the Trayvon Martin case, and the death of celebrity actor-singer Cory Monteith. Still, in literary circles, JK Rowling’s Half-Blood Prince moment (obscure Harry Potter reference) caused not just a splash but a tsunami. According to the BBC, the Sunday Times uncovered the deception after it became suspicious that such an accomplished novel as The Cuckoo’s Calling could really have been written by a debut novelist, and decided to investigate further. One need have only a nodding acquaintance with the world of publishing to greet this with the incredulity it deserves. A modest, mid-list title that has sold a grand total of 1 500 copies in three months does not spur literary journalists on to astounding feats of detective work. Three months is traditionally the point at which a book is no longer considered a new release. It stands or falls by how well it has done over that period. Sales of 1 500 are very modest indeed — positively South African in fact — although the book was extremely well-received by reviewers. Rowling has learned the unpalatable lesson that many writers have learned before her — that good reviews do not necessarily translate into good sales. 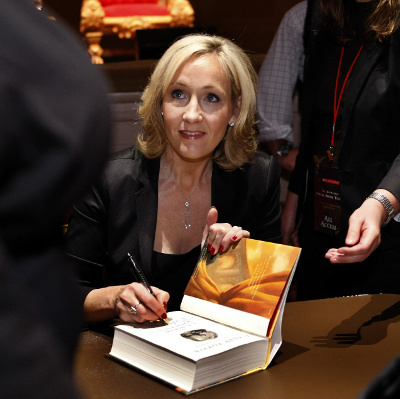 It is not being unduly cynical to speculate that Rowling’s publishers, having given the book a chance to succeed on its own merits, decided to step in and leak the sensational news to the media to stimulate sales. In just a few hours after the announcement, sales of the book had jumped by over 500 000%. Rowling herself told the Sunday Times that she wished the news could have remained a secret for longer. There is no reason to disbelieve her. It’s unlikely that making money is a primary motivation with her. She is already an extremely wealthy woman. Her main interest seems to be in building her career as a writer in these post-Harry Potter years. Rowling is not the first big-name writer to attempt to reinvent herself by resorting to a pseudonym. In the 1970s, Stephen King famously released a series of novels under the pen name Richard Bachmann. The first of these, Thinner, sold 28 000 copies during its initial run. King was motivated by two desires. He wanted to find out for himself how much of his success was due to luck and how much to talent, and he wanted to release more than one book a year, which was considered the limit for a single author at the time. He has since said that Bachmann’s cover was blown too early for him really to solve the luck vs talent conundrum. In 1992, the highly prolific romantic novelist Nora Roberts was warned by her publishers that they couldn’t keep up with her prodigious output any more. They suggested that she start a new series of books under a pseudonym. Thus the In Death series by J D Robb was born. Writer and publisher together decided to withhold the information that J D Robb was Nora Roberts, wanting the series to stand or fall on its own merits. It stood. Several In Death books had been published before alert readers began to notice similarities between the styles of the two authors. The news soon moved from being an open secret to a widely acknowledged fact. Oxford graduate, Madeleine Wickham, wrote six successful novels under her own name. These tended to be family dramas with an attractive infusion of humour. By the sixth novel there was a sense that she had shot her bolt — the work lacked the freshness of her earlier books. Perhaps knowing she’d come to the end of the road, Wickham submitted a brand new manuscript to her publisher under the pseudonym Sophie Kinsella. They accepted it, without particularly high expectations. The novel succeeded beyond anyone’s wildest dreams. A series of sequels and stand-alone books followed, soon catapulting Wickham onto the Britain’s Richest 100 Women list. She was in the unprecedented position of having a pseudonym that was vastly more successful than her real name. Sensibly, Wickham now writes only for the Sophie Kinsella brand. This fate is unlikely to overtake Rowling. Her real name will always be her foremost passport to literary success. One wonders where she will take her literary career next. The public is inclined to look indulgently on one pseudonymous stunt — a second may be too much for them to swallow.